When I first started learning Japanese, the amount of progress I could make in the course of a few months was astounding. Most of you will recognize this sharp beginner's learning curve, either because you're riding it now or are looking back at it wistfully. You've probably been warned about "The Plateau" or "The Wall" or "The Dip" – the level of language learning when you can communicate pretty well but have to convince yourself to keep going and keep refining your language until… what? You're a native speaker? That level of fluency seems pretty unreachable for most – and that's what makes the plateau scary. Instead of seeing this level of learning as a flat expanse, barren with barely formed grammar to the horizon, picture instead that you're on the 3rd floor landing up an infinite staircase. Your options for study-focus are endless. This article isn't just for advanced learners. 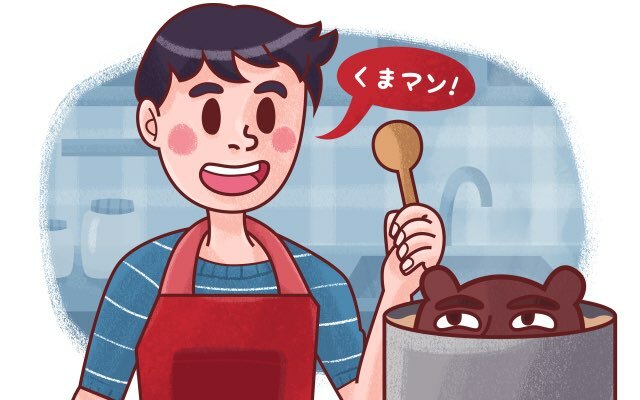 I'm going to talk about why cooking is one really good way to open up doors to new vocabulary, grammar, and even to more confidence when using Japanese, and I'll outline some ways you can get started. But, these techniques aren't only limited to cooking either. Convert them over to other activities as well. Drawing, martial arts, whatever it is you're interested in! Just make sure it's a Japanese activity with plenty of Japanese vocabulary to get the most out of it. If you've ever taken a Japanese class or tried to use your TextFugu-polished skills with a Japanese friend, you're probably familiar with how nerve-racking it can be to have a Japanese conversation. You try to keep up with the facts of what you know they said while filling in the gaps of missing vocabulary. You conjugate verbs and structure the sentence pattern in your head for what you'll say when it's your turn to speak. On a daily basis – if you live in Japan or work in a Japanese company – this can be outright exhausting. There are all kinds of reasons to keep up that practice (for starters: it does get easier and less nerve-racking). But today I want to focus on something a little more basic: talking to yourself (with a focus on cooking). You probably do it in your main language all the time, but how often do you do it in Japanese? Second-language researchers have a special word for "talking to yourself". They call it "private speech", and "it emerges most often in the face of some challenge" (Ortega 220). One researcher, Tomlinson, conducted and compiled studies where EFL (English as a Foreign Language) students were given time to compose their thoughts before needing to present them. He suggests that "without an effective inner voice, we cannot produce meaningful public speech" (Tomlinson). "Meaningful" in this sense means that you've had a chance to process the topic or issue at hand before speaking. That said, private speech in our native language seems less complex and more reflex, like the "Crap!" you hiss when you spill your coffee. Nothing meaningful there? Well, what would you say in Japanese for the exact same scenario? What other things could you say in this context in both English and Japanese? There are lots of these situations where not knowing what to say at such a basic level might remind you of how limited your Japanese is, and that could lead to some pretty negative feelings with the whole experience. Not good – generally and specifically when you're trying to get better at the language. 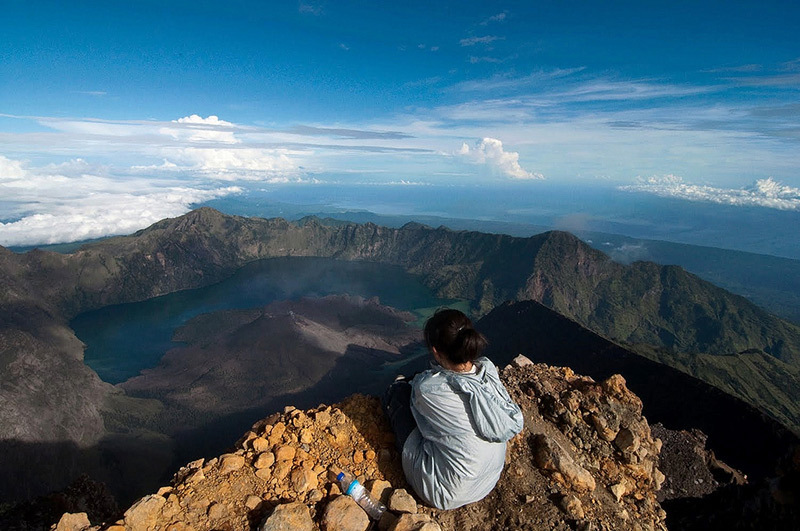 If you're facing the plateau and thinking "What next? ", private speech is a good place to get started. It is so daily and basic and personal, yet it is mostly untaught in language learning. So setting up situations where you could talk to yourself (or your cat) is a good stepping stone towards a more complete fluency. I talk to myself a lot. I also talk to my cat, which is almost the same thing as talking to myself. This "private speech" happens mostly when I'm cooking. We all love food, so how about we spend a little time upping our kitchen-ready vocabulary? Obviously, before being able to talk to yourself in Japanese while cooking, you'll need to know the relevant words pretty well, so consider making some flashcards or an Anki deck. 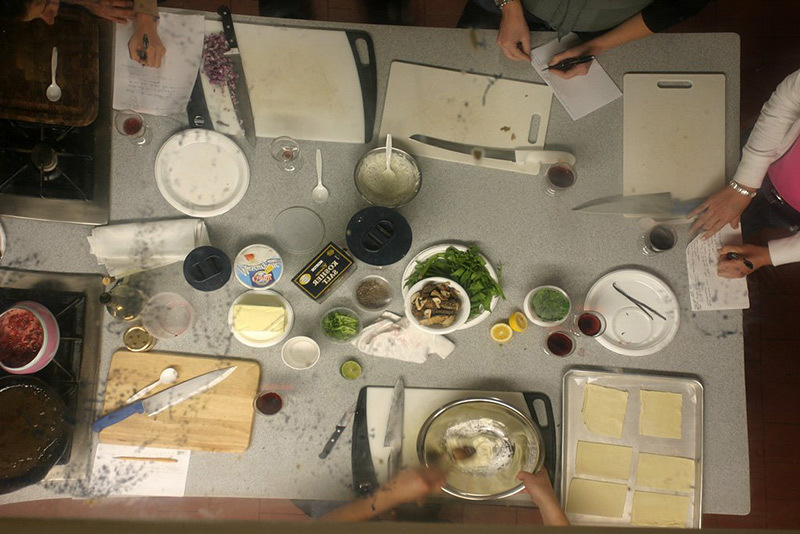 The idea is to become familiar enough with them that you are able to recall them while doing the related task (in this case, cooking) so that way we can use them later during private speech, ingraining them into our minds. Now that you know words to use while you're cooking, I'll give you some to use while you're making your grocery list. As you can see, we're going through and learning vocabulary for various activities revolving around the main activity, which you know is cooking. In theory, you could come up with some other word lists as well. What about words for cleaning up? What about words for various kinds of (completed) dishes? The list goes on and on. Start out simple and work outwards. You'll start to see some overlap between lists, which is good, because that will help you pinpoint more common words. Then you'll start to find words from your lists becoming useful in other situations as well. The more you branch out the more you'll be able to talk about. Sure, talking about cooking isn't all that useful in most situations, but after a while the important stuff floats to the top, kind of like the scummy bubbly stuff that you scrape away when making sukiyaki. Step 1: Find a recipe written in Japanese. I used to watch an NHK show called 今日（きょう）の 料理（りょうり）（Today's Cooking) and found the recipes online after each episode so I could try making the food myself. But it's easier to just go to Cookpad, one of the largest recipe sites out there. There is a wide variety of recipes, so finding something that you have the means to make should be no trouble. Finally, for recipes that use hard-to-come-by Japanese ingredients (like na no hana), there are usually appropriate substitutions to accommodate what's available to you, which some English sites describe, such as Makiko Itoh's Just Hungry. Step 2: Once you have a Japanese recipe picked out, read through it once to test your reading comprehension. Diagram step-by-step what you understand from the first read-through. 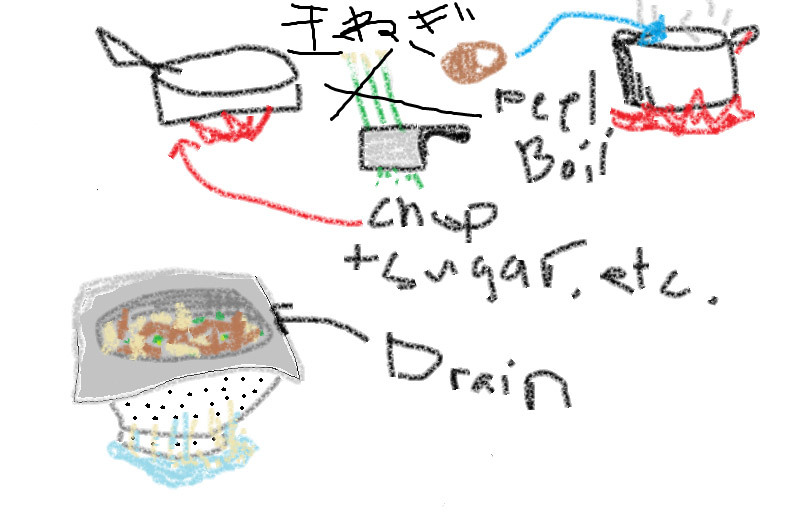 Even with English recipes, I diagram what has to happen at each step because otherwise, I mess the dish up. Step 3: Highlight the words you don't know, look them up, and do what you feel is necessary to remember them. Otherwise, the next step will probably solidify your memory of those words. Step 4: Go through your kitchen and name the ingredients you do or don't have for the recipe. Obviously, do this in Japanese. This could be where you start talking to yourself! 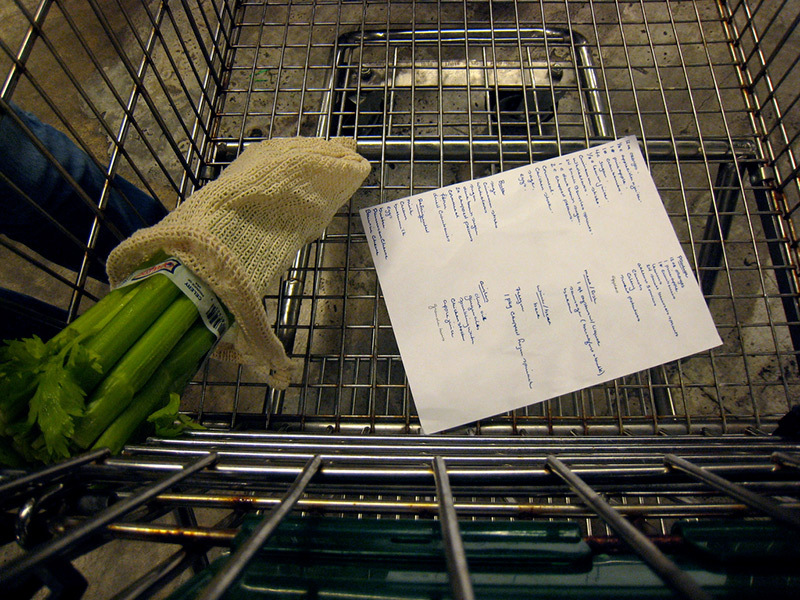 Write up a grocery list for the items you don't have. Use quantities and counters. Step 5: Then, go to the store, shop around with your grocery list that's written in Japanese, bring the stuff home and start cooking delicious food. For example, I love nikujaga, and stumbled upon a recipe for nikujaga croquettes. 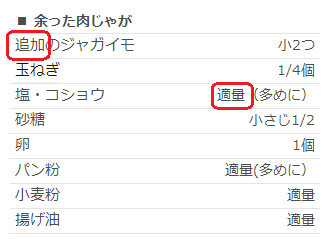 And then I went on to find out the readings and meanings for ざら、お勧め、and じっくり, and add them to my list to memorize. I'm out of ginger. I need to buy meat, too. Momo, I've got to go get some things from the store. It's needed for dinner. When I return, it's time to make food. I start cooking the Nikujaga, make croquettes with it, and talk to myself. In Japanese! Ah! I burned my tongue. Yeah, Momo, I'm okay. Just lost my taste buds and now the soup tastes like mush. Ok, that's ready. Now…oil. 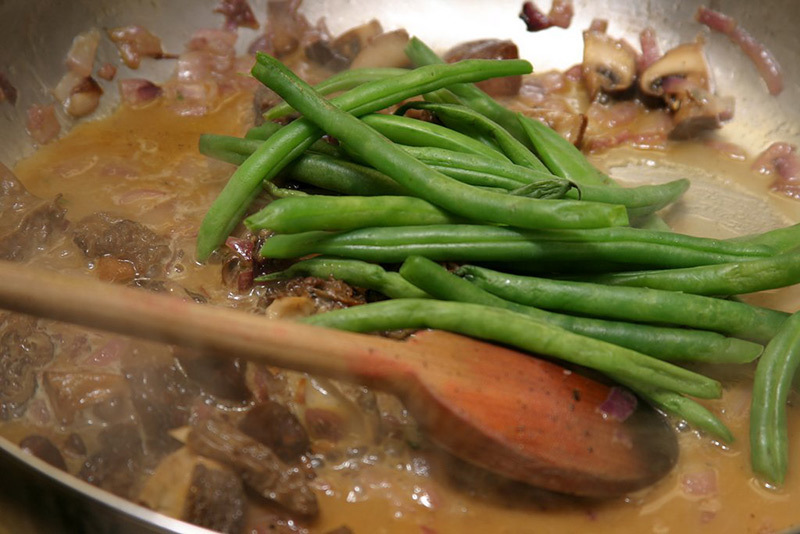 Put the oil in (the frying pan) and sautee for… two minutes. Momo, stop messing with the shopping bags! Now I have to clean up all that splattered oil around the stove… I've got to wait for it to boil, so I may as well wash some of these dishes and get rid of the old leftovers in the fridge. I need some clean tupperware, anyhow. Crap! It stuck to the pan. And it burnt! If the grammar in these sentences is new, maybe the whole phrases are things to repeat and practice, the way you might practice some lines from a J-Drama. The above lines come off as neutral to slightly girly (bold-text is more feminine). So if you're looking for Japanese that is more boyish or more samurai-ish or whatever, look into Japanese gendered language. That picture up there- scary? Hundreds of feet above ground with nowhere to go but down? Sure. But that's not what "The Plateau" has to look like. Cooking and talking to yourself is, I hope, a new and exciting trail for those who are independently studying Japanese. Start out simple. You don't have to be making complete sentences from the get-go. When you need negi, just grab the negi and say "negi" to yourself. Or, when you're eating some of your nikujaga, say "nikujaga wo tabeteiru." Simple things like that will start getting you in the habit of speaking to yourself in Japanese. As you need to learn new things you will learn them, allowing your vocabulary blossom and grow like some kind of weird tree that feeds off of knowledge. And like I mentioned before, you don't have to do this with cooking either. Choose your own activities, talk to yourself about them, and allow this habit to infect other things after you feel pretty comfortable with one. Don't kill yourself doing this and just let it grow naturally. Human nature will take over and you will become curious about how to say this or that and you will get better, so long as you're having fun with it.